Cherry eye is a prolapsed eye gland. While it can look quite alarming, it is pretty common, especially in certain types of dogs. A canine third eyelid is called a nictitating membrane. Dogs have two tear-producing (lacrimal) glands in each eye. One is located in the upper lid, and one is the lower lid. The lower lid holds the nictitating membrane. The nictitating membrane is a transparent or translucent lid that passes over the eye for protection and to moisten it while maintaining vision. A dog's third eyelid (one in each eye) can get prolapsed or protrude from the eye and create a cherry-red lump in the corner of your dog's eye. Exposure of this sensitive third-eye tissue often results in secondary inflammation, swelling, or infection. Cherry eye appears like a very red lump in the inside corner of the eye, or eyes if both are affected. Despite its angry, red appearance, this condition does not cause pain but can interfere with the normal tear production for that eye. This third eyelid gland is thought to produce approximately 30 percent of the tear production for the eye. Cherry eye occurs when the tear-producing gland swells or protrudes from the lid like a red, fleshy mass. When the gland protrudes, called eversion, the usually moist tissue is exposed to air and other irritations, like a paw. This can cause the interruption of blood supply to the gland. You can treat cherry eye with medication or there are different types of surgery. Sometimes cherry eye will correct itself if you do nothing, although this is not often the case. 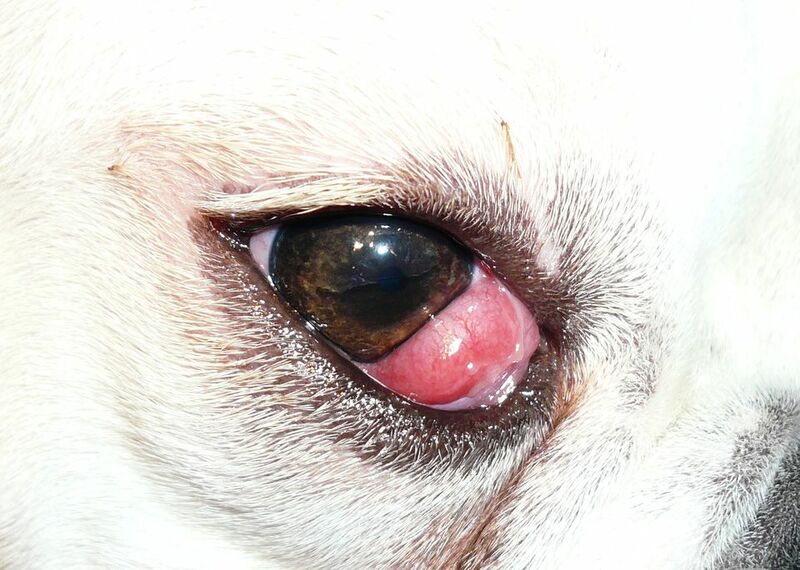 If caught early, cherry eye may be resolved with a closed-eye massage of the affected eye or with antibiotics and steroids. Either way, topical medication can help reduce the inflammation and prevent or resolve the secondary infections that are commonly associated with the condition. If left untreated, this condition can lead to dry eye, keratoconjunctivitis sicca, and other complications. One way to fix cherry eye is to create a pocket or envelope that requires suturing of tissue around the prolapse, encasing it in a layer of the conjunctiva, which is the lining of the white part of the eye. If surgery is recommended, this is usually the safest method with the highest success rate. Another method, which is much harder to complete successfully, is to surgically reposition the eyelid, or anchor the eyelid to the globe of the eye. The biggest risk using this technique is a recurrence of the condition or the sutures causing a problem for the eye. The preferred way vets used to treat cherry eye was to remove the tear gland as it is a relatively simple and quick surgery. The problem with the removal of the gland, especially in young dogs with many years ahead of them, is the development of chronic dry eye. As animals age, tear production decreases. Preserving the gland early in life benefits the dog in the senior years. Vets now recognize the importance of preserving the tear gland. Surgical removal is still performed in some cases. If you choose to have the gland removed, it is likely that the dog will need to be treated several times daily with moisturizing eye drops for the rest of its life. Your veterinarian may do this surgery or refer your pet to a veterinary ophthalmologist. This is a veterinarian who has had advanced training and certification in ophthalmology, the branch of medicine concerning eye diseases. The American College of Veterinary Ophthalmologists is a good place to start your search for an eye specialist for your pet. Cherry eye is not preventable. It is most often seen in young dogs under the age of two. The cause of cherry eye is not fully known but thought to be a weakness in the eyelid tissue that normally holds the gland in place. Genetics may play a role. Some breeds, such as spaniels, Shar-Pei's, bulldogs, beagles, Lhasa apsos, Shih Tzus, terriers, pugs, and bloodhounds have a higher incidence of this condition. While not preventable, if you notice redness, bring this to your vet's attention right away. You may be able to prevent the gland from developing into a complete prolapse. How Often Do You Have to Get Your Pet Vaccinated for Rabies?